If you heard you could create a tubular bind off with knitting needles, and do it as fast as a regular bind off, would you think it was an April Fool's joke? Well, the good news is that although it IS April fool's day, this isn't a complete joke. You CAN create a sort of a tubular binding off, fast and easy, with knitting needles alone. 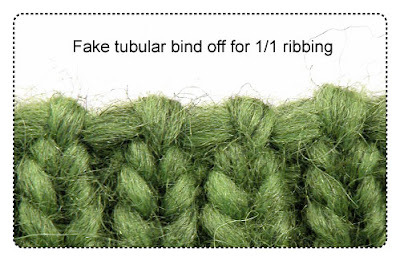 Here is another TECHknitting "unvention"* FAKE tubular bind off. First, some terminology. "Binding off" and "casting off," "bind off" and "cast off" are all terms used inter- changeably. They refer either to finishing off your knitting by turning a line of live stitches into a stable, finished edge, or they refer to the finished edge itself. Why a FAKE tubular bind off? Real tubular casting off is flexible, good-looking, reversible and ... something of a pain. Real tubular bind off is unquestionably an good skill to have (and here is a link to it) yet it is rather slow. The TECHknitting fake tubular bind off much quicker. Although it is non-reversible and somewhat inflexible, it makes up for these shortcomings by being easy and fast. Plus, there are situations (pocket tops come to mind) where flexibility and stretchiness are not wanted, yet a pretty bind off for ribbing IS wanted. Fake tubular bind off is done with the standing yarn, not a length of yarn, and it is done with knitting needles, not a sewing needle. It doesn't look as quite good as real tubular bind off, but it's a decent imitation. And although it is as quick and easy as regular 1/1 bind off, it makes a better, thicker edge than regular bind off does, and looks a whole lot better. 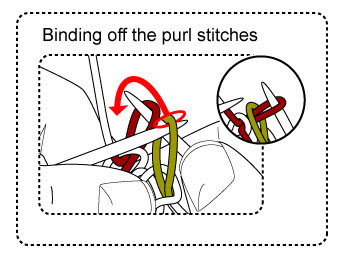 See for yourself--here's a comparison of all three types of binding off, side by side. (These instructions are for 1/1 ribbing only.) The easiest way to arrange matters is so that you've got a knit stitch on the tip of your right needle, and the first stitch to bind off is a purl. Step 1 With your right needle, purl the purl stitch waiting on the tip of your left needle (TIP: draw the purl stitch loop up fairly large--as you will see when you get the rhythm of this bind-off, this purled stitch has to stretch across two stitches before it will be bound off in its turn.) The stitch thus purled (brown) will now be at the tip of your right needle. Insert the tip of your left needle into front of the stitch TWO stitches in from the edge on your right needle (green). Following the path of the red arrow, draw the green stitch LEFTWARDS over the top of the brown stitch and drop the green stitch off the tip of your left needle. The green stitch has now been bound off (inset picture). Step 2. Knit the knit stitch which is waiting next on your left needle (brown). Slip the brown stitch back to your left needle. Next, slip the stitch at the tip of your RIGHT needle also onto the tip of your left needle (green). (The illustration picks up at this point--where both brown and green stitches have been slipped to the left needle.) Insert the tip of your right needle into the front of the brown stitch. Following the path of the red arrow, and draw the brown stitch RIGHTWARDS over the top of the green stitch and drop it off the tip of your right needle. (TIP: Adjust the tension so that the brown stitch loop is not too big--as you will see as you get the rhythm of this bind-off, the bound off knit loops do not have to stretch at all, and therefore do not need to be made too loose.) The brown stitch is now bound off (inset picture). Return the green stitch to the tip of your right needle by slipping it purlwise (open). Ta da! An easy, fast, good-looking bind off (cast off) for 1/1 ribbing, made with very little trouble. TECHtip: On circular knitting, for the last stitch: thread the remaining yarn onto a sewing needle and sew the final stitch shut. 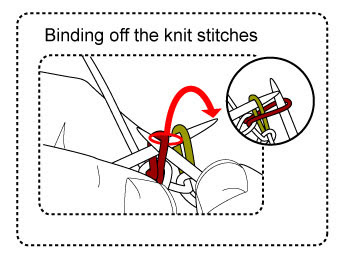 Avoid a jog by passing the threaded needle once around the base of the first stitch bound off, then work in the tail right along the edge, under all those slipped knit loops. *"Unventing" is when a trick reveals itself to you--a trick you expect someone somewhere has done, but it's new to you.